Every morning, the fine folks at Sports Radio Interviews sift through the a.m. drive-time chatter to bring you the best interviews with coaches, players, and personalities across the sports landscape. 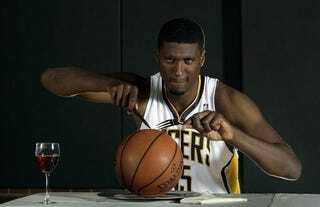 Today: Hibbert also talks his Parks and Recreation cameo. Roy Hibbert joined 790 The Ticket in Miami with The Dan LeBatard Show with Stugotz to discuss his guest role on the TV show "Parks and Rec," his life goals, living modestly so he can take care of his family, dumb ways of spending money, using coupons, getting discounts on burritos, using other coupons, who he learned such things from and the worst part of being a 7-footer. "It's based in Indiana and I also watch the show religiously. I've seen every episode. I gave my agent a call and he said, ‘Let me give Lorne Michaels a call.' … He made it happen." "I wanted to be on TV for something besides basketball. To be able to do that was pretty neat but I did play a basketball player who was out of a job. It was fun though and it ranks in my top three things that I always wanted to do." "Obviously playing in the NBA and making sure to take care of my family. I've got two of those three things down and one more. I've just got to be diligent and smart with my money and I'll take care of the last thing." "I can, but I just want to make sure I do it the right way and not like a lot of these young guys who spend it all and don't have anything to show for it in the future when they retire." "Anybody who probably lives alone and they have three or four cars, that's probably somebody that's spending a lot of money that they don't need to. I've got one car and got one for my dad and I try to live modestly." "I'd just have to say I don't have an entourage. I make sure I keep everything tight, checking on my bills. Going to restaurants, I make sure if I have a coupon, I use it. I try to live like I'm a normal person." "Obviously you have to go to the newspaper. And I still have my college ID. I know that during the lockout that Chipotle and Qdoba have like College Night and the burritos were like half price, so you have to whip it out." "Yeah I guess I don't want to end up being one of those stories where the guy ends up spending more than he has and owes money to the IRS and stuff like that. I just want to be able to take care of my family and live modestly." "When you go to Best Buy and after you buy a certain amount of stuff, you get credit and stuff like that. I make sure, and my mom makes sure, that I call in so I get to use that credit so I can get free stuff or … use those credits. I make sure that I call back that number at the bottom of the receipt all the time." "To do that all the time is pretty dumb. Every once in a while you have to go out and treat your family and friends and stuff like that. Once every two months, I'd say, is when you do that. When you do it every weekend it gets a little excessive and the people around you start feeling like you have to do that every time you go out. People who go out with me know that they're not going to get that all the time." "I'd have to say Jeff Foster. He makes sure on gamedays, whenever he buys something, he [checks to make sure] you couldn't use that as a business expense. … He taught me that when I was a rookie." "People coming up to me asking me if I'm Hasheem Thabeet. That's probably the worst thing. No offense to him, but I look nothing like him." • The 49ers are preparing for the Saints. • Demaryius Thomas hopes the Broncos air it out a little. • Bill Polian has no hard feelings.